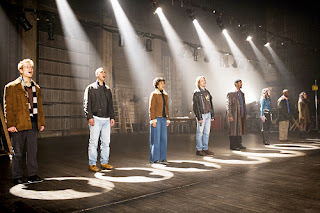 Usually when viewing a musical I can recommend it on the merits of how great the music and dance choreography is but with the 2005 musical “Rent” I had a hard time deciding between what I felt in my heart and my mind. My mind was telling me that this was an outstanding musical with lots of stellar musical numbers, style and having the guts to talk about lots of serious subject matters. But my heart was telling me this movie was disturbing, mean spirited and at times offensive. The movie depicts the lives of several Bohemians and their struggles with sexuality, cross-dressing, drugs, homosexuals and lesbians, life under the shadow of AIDS, and paying their rent. It’s very depressing and it gives the film a very downbeat overtone but it clashes with all these very upbeat and energized musical numbers. Most of the songs themselves have this exact contrast, there’s one song called "What You Own" and it sounds so upbeat with such a sizzling vibe that you’d swear it was a vacation song or something like that, yet the song focuses on life struggles and we see images of people out on the street playing music to gain money and all kinds of unpleasant things. It gives you a wired feeling, honestly don’t know what I’m supposed to feel while watching this film. Before I get to ahead of myself, let’s look at the individual stories and subjects that are all present in this film. It all takes place in the East Village of New York City in the late 1980s and we have three stories that the film focuses on. The best story that the film should have focused entirely on is a guy named Roger Davis who just lost his girl friend to aids. Now he’s falling in love with a girl named Mimi who lives next door to him and is also suffering from aids. Roger loves Mimi but he is afraid to have a serious relationship with her because he doesn’t want to feel the pain of losing someone he loves to aids again. This, to me is an interesting concept and is well portrayed by the two. The thread that holds all these individual stories together is a filmmaker named Mark Cohen who moves in and out of these three stories and is what links them together. The last two story arcs follow the same theme of homosexuality, we have two boys named Angel and Tom who are in love and there’s two girls named Maureen and Joanne who are trying to get married. Personally, this is a subject that always makes me feel dirty and sick but I’m certainly not talented enough to discuss why I think it’s bad, so let’s just move on. The film does have a terrific selection of songs and it’s hard not to recommend to people who love musicals. The opening song called “Seasons of Love” starts things off very well, it has a very sweet and beautiful melody. The actual “Rent” song is another musicale number with a lot of energy and a very entertaining beat despite the depressing concept of not being able to pay for your rent. “Tango: Maureen” is an interesting dance/musicale number, it’s the only song that features choreographed dance extras in the background and some really fun dance choreography from our leads in the foreground. My favorite musical sequence is “Out Tonight and Another Day”, not just for the great music and but for the changing settings, it’s focuses on Mimi as she begins at work (which happens to be a place for strip dancing) and then we follow her on the road, in her apartment, in someone else’s apartment, back out on the street, interacting with different people and it all happens the some musicale number, it’s great. Other great songs that I love from this film include “One Song Glory”, “Light My Candle”, “I should tell you”, "What You Own", “Love Heals” and “Know Day But Today Reprise”. It’s great that many of the actors are actually from the “Rent” show on Broadway and they all can sing very well. There are some songs that I don’t care for and are just plain forgettable but there’s far more good than bad. If you don’t want to be subjected to the films depressing, unpleasant and just all around odd feel, I still highly recommend listening to this soundtrack on its own because it’s really good. This movie was directed by one of my all time favorite movie directors Chris Columbus, who’s worked on other great films including “Mrs. Doubtfire”, “Home Alone”, “Gremlins” and the first three “Harry Potter” movies. As always Chris gives solid direction and the characters have good chemistry. Like I said earlier, the films music is fun and upbeat but subjects are very depressing and even the look of the film is downbeat. Everything is shot in the dark and you’re always looking at ether a dirty apartment or street ally. Fans of the Broadway play will be pleased with this adaption but anyone else might be very picky at plotlines and situations that seem to just come out of no ware, there’s plenty of subjects that regular viewers may even take offence too and it makes this film really hard to recommend. With music this good, I definitely recommend the soundtrack but watch the movie at your own risk or at the very least be aware of what you’re getting into because it has a lot of uncomfortable sensuality and it’s a downer. 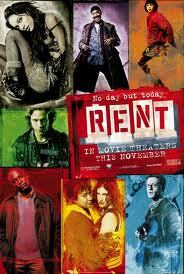 I’m still very glad I saw it because it dose deliver some powerhouse musical numbers, I give “Rent” 3 ½ stars.